My friend S was passing through with her friend J (Army life!) and crashed with me and Duke for a night. 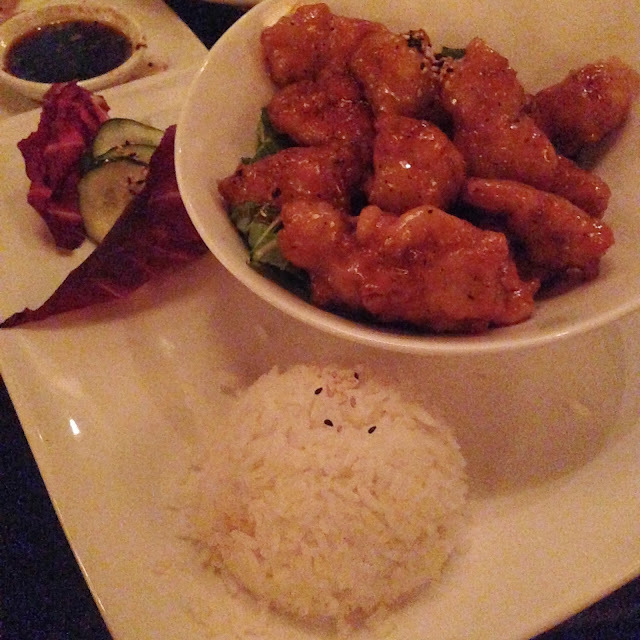 Since they arrived in time for supper, us girls went to Wild Ginger for some Asian fare. I heard about Wild Ginger from friends and coworkers, mainly because it's a very upscale sushi restaurant where a lot of local celebrities come through... Celine Dion, Jason Aldean, Luke Bryan, Taylor Swift, even the occasional rapper. We spotted someone who looked familiar and possibly famous, but couldn't figure it out. Oh well. We started with an order of Tokyo gyoza, pan-seared pork and vegetable dumplings. I don't eat much seafood, so these are my Asian fusion standby! They were sooooo delicious, some of the best I've had. We also got an order of their Bombay calamari. I don't usually eat calamari, but when I tried these I was blown away. The batter tasted like a funnel cake, and the squid was better than I expected. The mango chili sauce that went with it was great too. Gyoza and Calamari... after we'd already munched on a few! 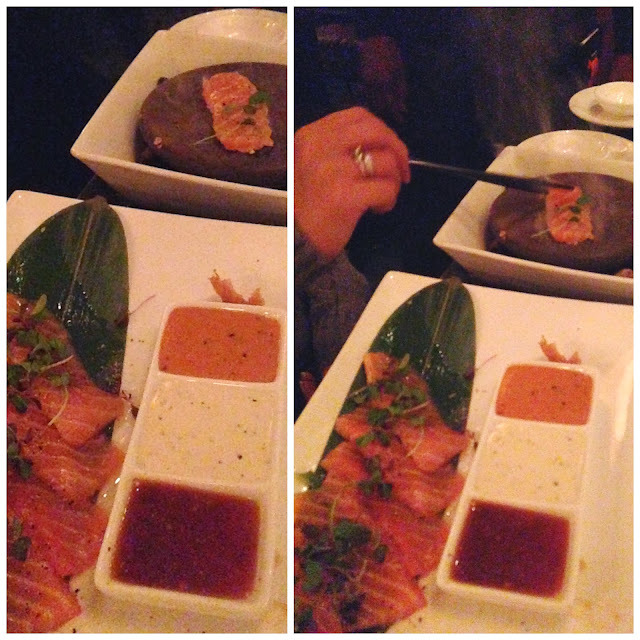 S got the Scottish salmon on the Hot Rock Ishiyaki Grill. I've never seen this before! The server came out with a super-hot rock (seriously, don't touch it) that we seared the raw tuna on before eating. At the table! The sizzling sound was awesome. The salmon also came with three sauces: chipotle garlic cream, horseradish aioli, and sambal mustard ponzu. S & J split the salmon and a sushi, which was a HUGE roll. While the prices at Wild Ginger are fairly expensive, the portions and presentation definitely make up for it. Look, I'm boring when I'm at a new restaurant. I like getting something I know will be a sure thing. I chose the wok dish Honey Sake Glazed Chicken. It was HUGE (I could only finish half of it) and soooo good. The chicken was juicy and crispy, and I didn't need to add anything to the dish. At the end of the meal, S & J insisted on treating me to dinner (TOO GENEROUS! They also gifted me some gourmet coffee from Hawaii.) so I must include this photo of us at the end here. I love living in Tennessee because so many people pass through that I get to see. S and I hadn't seen each other in six years, but it was like we'd never skipped a beat. I'm so thankful to have such great Army buddies to reconnect with when the opportunity arises. I love Wild Ginger but rarely go there because I am cheap. However, I would definitely recommend it for lunch as a good way to check out more dishes at a good price. I now want to inhale that rock seared tuna. That looks magical.